In the IP video market there has been a recent influx of 360° hemispheric cameras from manufacturers like Axis, Panasonic and Vivotek. 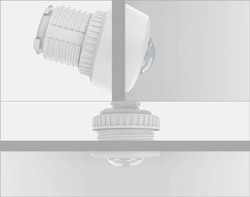 When ceiling-mounted, these cameras can capture an entire room at once and feature integrated distortion correction software to eliminate the distortion associated with extreme wide-angle lenses. The S14D has no built-in lens but instead, features Mobotix’ FlexMount technology. Up to two lens modules can be connected to the camera, each on its own 2m cable. The lenses are designed to be recessed into walls or ceilings and with a minimal cross-section, they offer effective discreet surveillance. Each lens module provides its own 360° overview – with colour (3MP) and monochrome (1.3MP) options available – and captures audio through its integrated microphone. 15° tilt brackets are also included to aim the camera when wall mounted. With FlexMount, and the dual-lens variant in particular, this increased flexibility provides a wealth of surveillance options. Mounted back-to-back, the camera can capture footage from all angles simultaneously, including above the camera. It’s also, for example, suited to monitoring access to secure areas, monitoring both internally and externally at the same time. With 2m of cable per lens module, it’s possible for the camera to monitor two completely separate rooms with the same camera, opening up a wealth of placement and monitoring opportunities. Using a colour and monochrome lens module in tandem the camera is unique in being able to monitor separate but adjacent dark and bright areas, for example simultaneously and from the same camera monitoring inside and outside building entrances or production areas. Alternatively, the lenses can be mounted side-by-side for day/night hemispheric monitoring. Both the camera base unit and the lens modules are IP65-rated, so are suitable for outdoor deployment, further improving the camera’s flexibility. Mounting the lenses is also extremely easy either vertical in ceiling-mounted mode, or horizontal in wall-mounted mode. The cameras come with mounting wedges to allow them to be mounted at an angle as well. The flexibility of the S14 range makes them suitable in a wide range of surveillance, access control, building and process monitoring and manufacturing scenarios. The possibilities really are endless.